Here at 円教寺 Enkyoji Buddhist Network we feel that your wedding ceremony should reflect and show your commitment of your love and dedication towards each other. Celebrating together with your family and loved ones or privately, the Buddhist ceremony is offers many wonderful traditions to express and capture this important event in your lives. Our wish is to support this important day and develop together the perfect ceremony representing both of you. Buddhist ritual is meant to capture each important essence of the teaching and expression to inspire us to use this moment to open ourselves to growing and enjoying the wonderful moments that life brings us. In all situations, we are happy to work with you and design a ceremony that is right for you and how you wish to express your personal story. Choeizan Enkyoji Temple is a welcoming Sangha, which supports and welcomes all families and couples. All of our ceremonies are led by our head priest who is a certified priest of the Nichiren Shu tradition of Japan. We are looking forward to working and sharing this wonderful experience with you and your family. We have different rates and packages available according to your request and wedding needs. Please contact us for more details and to discus the different options that are available to support your special day. Any fee for the first planning meeting is waived if you elect to work with someone else after our introductory meeting. Coaching is offered by our head priest to support couples in dealing with some of the issues that come up during or after the process. 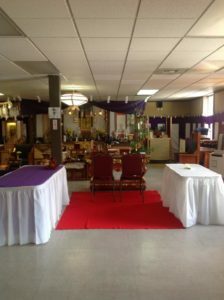 Meetings should be scheduled by contacting the temple office by email: enkyoji.net@gmail.com or by phone: 206-356-7405. A small bell that rings to announce for the guests to enter, traditionally this is a fire bell that is rung outside for all to enter the building. This is another announcement by the gong and taiko drum used to announce the ceremony is about to begin. This is the initial music for the couple to enter into the sanctuary. This is the parade of the entering of the wedding party and priest into the sanctuary. The officiating priest greets the guests. A verse, that is in the form of a melodic chant from ancient Chinese Buddhism origins. This hymn is a reverent way to welcome the deities and Buddha’s to come to the sacred space created for this celebration. This chant is to acknowledge that we are opening the sutra, expounding our intent, and focusing ourselves for this important ritual. Most chants are in shindoku , an archaic Japanese rendition of the sounds of an even older Chinese pronunciation. A Gong and cymbals, originating from the ancient courts of China used in royal performances. They survive today as period instruments in gagaku, the court music of sixth century Japan. They are struck in a very distinctive way unique to the Nichiren Shu tradition. Shusan is a Dharani, a ritual phrase similar to a mantra sung in archaic Sanskrit, which praises the Buddha’s great virtue and teachings. Reading highlights of chapter 16 of the Lotus Sutra which tells us that the Buddha is indeed eternal in nature and has always existed in the past, present, and future. This is an elaborately folded letter, announcing to the Buddha the new marriage of the couple. 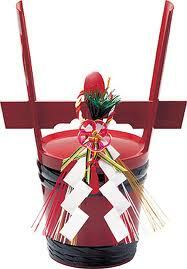 This is later given to the newlyweds as a memento to be kept in the family butsudan. This is a gift of juzu, prayer beads, from the couple to each other. Instructions read from our Founder, Nichiren Shonin. At this time the exchange of marriage vows read by the couple. This is the traditional middle intermission music while the ceremonies below take place. This is the ancient ceremony of San-San-Kudo, exchange of nuptial cups of sake. San-san-kudo literally means “three, three, nine times.” The cup used at san-san-kudo is a special one called “sakazuki,” which is only used to drink sake and no other beverages. The bride and groom take turns taking three sips from each of three different bowls of sake, each one larger than the next. 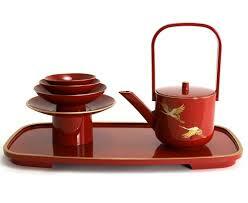 One does not drink the sake like a ‘shot’ but rather tilting the cup up very gradually and sipping lightly. Three is an indivisible number, and it is considered a sacred number in Buddhism. Nine means triple happiness. 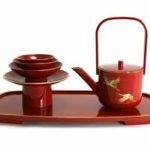 Just as the san-san-kudo sake sips may not be altogether delicious, the couple’s marriage life may not always be delightful, but they will have to overcome their hardships with the co-operative spirit of the san-san-kudo. By exchanging the nuptial sake sips—three times three—the couple is united. Couple leaves with officiate to sign the certificates of marriage and then return to the altar. In this ritual the couple serves ceremonial sake to both sides of the family by the couple to unite them as well in the marriage ceremony. A melodic chanting of the Odaimoku (Sacred Title), the core of Nichiren Shu Buddhist practice, Namu Myoho Renge Kyo, done together with an incense offering by the couple and supporters. This final prayer is to show the participants thankfulness to the Buddha’s and ancestors for observing and participating in the ceremony. Known as chanting of the four great vows of a Bodhisattva to save all sentient beings through one’s practice and efforts, followed by Odaimoku (Sacred Title) chanted once more three times. The newly wedded couple is presented to the guests. This is the recessional music during the departure of the couple.